Over the past couple of days I've been praying a little bit with my Breviarium Romano-Seraphicum, taking advantage of the new privilege to do so in Summorum pontificum 9,3. On Sunday I used it for Lauds, Terce, None, and Vespers. Sext got lost in a sea of liturgical preparation disasters (dirty chalices, unrecollected servers, the lady who stuffs the poor boxes with crumpled bulletins, etc) before the 11:30 Mass. Yesterday on the feast of the archangels, I prayed Sext from the BR while I was waiting around for a committal to get started at Gate of Heaven cemetery. Let me start out by saying that I'm not sure I'm even doing it right. I read through the rubrics during the presidential "debate" last week, but I was also talking to the brothers and answering the parish duty phone all at the same time. For instance, I wasn't sure how or if I was supposed to somehow commemorate St. Wenceslaus during the Sunday prayers. My immediate impression was to remark on the continuity of the BR with the current Liturgy of the Hours. Much of the Sunday psalmody was the same, and since I often pray with the typical edition Liturgia Horarum, I recognized almost all of the Latin hymnody. Going on, more than anything else I was almost taken aback by how much more psalm oriented the BR is when compared to the current LH. Compared with the simple psalm-OT canticle-psalm, psalm-psalm-psalm, and psalm-psalm-NT canticle schema in the current structure of Morning Prayer, Daytime Prayer and Evening Prayer (respectively), the psalmody of the BR seemed to go on forever. One thing I will say, and this isn't as small a thing as it seems, the BR is a lot more portable than the current breviary. You could almost put it in your habit pocket if life were simpler and it weren't for cell phone and PDA. For someone who lugged one or the other fat volume of the Roman-Franciscan Liturgy of the Hours all around Boston during five years of theology, it was nice to have something so much more portable. I haven't been brave enough to try matins. I'm still confused about this one or three nocturn thing. The feast of St. Francis is coming up this Saturday, celebrating his birth into eternal life during the night of October 3, 1226. Today I've begun to reflect on Francis and his influence on me, having been jump-started by this post from Jeff. I've spent almost half of my time in this life trying to put myself under Francis's influence. Oddly enough, I first met Francis not in church, but in a history class. This was before I was even a Catholic Christian, and my initial attraction to Francis was almost entirely secular. It was the time of the first war in the Persian Gulf, and I was in my first year of college. To me--at the time--the violence had less to do with liberation and more to do with an economic system that had ceased to serve humanity and begun serving itself. Whatever it was, this "system" as my friends and I called it in our adolescent way, I wanted out of it. I looked at my own life of privileged leisure, in which I was free to study philosophy for a couple of hours each day and then spend the rest of my time drinking, going to punk shows, and chasing girls with my friends. A kind of crisis of personal responsibility as a "human being in the world" was brewing in me, but I didn't yet recognize it as a spiritual problem. During this time I took a history course that covered thirteenth-century Europe. And there was Francis of Assisi, and right away I saw someone I could relate to. Born into a world of violence, he gave up his dream of knighthood after being imprisoned when the Assisiani lost the battle of Collestrada in 1202. Born into an economic system that began to divide people from each other, Francis opted out of it, and decided to be poor on purpose. I too was looking for a way to opt out of the "system" and--praised be Jesus Christ--I had found my model. The Incarnation of the Word in the human life of Jesus Christ reveals the unseen God, but it also reveals God's vision for our humanity. My homily for this weekend is posted here. Today my "new" Breviarium Romano-Seraphicum arrived in the mail, published by the authority of our minister general Clement of Milwaukee in 1962. According to Summorum pontificum 9,3 I now have permission to use this version if I wish. (And if I can learn how!) The set seems to have once been ad usum for a Father Louis of the Couvent des Capucins in Mons, Belgium. They have a nice website you can visit here. Louis must have passed from this life or returned to the world soon after inscribing his name in his new breviaries, because they are hardly used. During the workweek, our first Mass is at 6:45 am. It's really my favorite, because it's usually quiet and reverent, and there is only one paten and one cup without extra vessels to fuss over. Right now is also my favorite time of year for the early Mass, when the beginning is at about dawn. It just seems to make sense to me to prepare and open the church while it is still dark and then have it be light at the end of Mass. It's so peaceful to walk into the church around first light--what I always understand by the summo mane of the rubrics of the Liturgy of the Hours--and greet the Lord in the Blessed Sacrament in the mystical and quiet darkness. That's just the way I've always felt as a praying person; prayer to me is a kind of blessed darkness. That's one of the reasons I was so grateful to discover John of the Cross, who speaks of the rayos de oscuridad, the "rays of darkness" that shine upon us in contemplation. On the other hand, to have it still be dark out at the end of the early Mass, as it is in the winter, is just depressing. That's why this time of year, and I suppose its opposite in the spring, is my favorite time of year for our early Mass. One of the first portable practices I learned as a Catholic was how to pray the Rosary. From somewhere or other I knew that you were supposed to pray the Joyful Mysteries on Mondays and Thursdays, the Sorrowful Mysteries on Tuesdays and Fridays, and the Glorious Mysteries on Wednesdays, Saturdays, and Sundays. When John Paul II suggested the Luminous Mysteries back in 2002, I liked them a lot, and somewhere along the way I learned that you were supposed to pray them on Thursdays. But it wasn't until this morning, sitting in church, that I noticed how this knocks down the Joyful Mysteries to one day a week, while the Glorious Mysteries still had three days. No fair! It's especially too bad, I thought, because the Joyful Mysteries day is a perfect time to substitute the Franciscan Crown for the standard Dominican Rosary. This has to be evened out, I thought. So, Fridays and Sundays have to be the Sorrowful and Glorious Mysteries, respectively, for obvious reasons. Given those necessities, I decided that the Glorious Mysteries should cede Saturday to the Joyful. When I got back to my room, I looked in a Rosary pamphlet that I had picked up for the kids RCIA, and there it was, arranged anew just as I had decided. So much for paying attention to what I was doing all this time! Age quod agis, frater. P.s. My hometown church is staffed by the Dominican friars. One time, after the Luminous Mysteries had appeared, I asked one of the friars what they were going to do about it, seeing as their traditional, fifteen decade habit rosary was now sort of obsolete. Would they upgrade to one with twenty decades? To my surprise, the brother seemed genuinely annoyed by the whole business, and by the failure of John Paul II to consult the Dominicans before "changing" their Rosary. If you get this riff and reference, you're cooler than me. 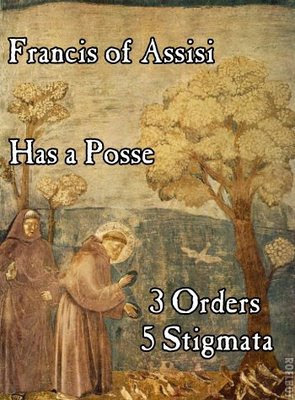 Francis of Assisi has a posse indeed. Apologies to Andre the Giant, and ObeyGiant. God invites us to cultivate his kingdom, and promises us a just reward for our labors. My homily for this weekend is posted here. The other day someone pointed out article 9, paragraph 3 of Summorum pontificum to me, which gives clerics in major orders (i.e. bishops, presbyters, and deacons) permission to pray the Liturgy of the Hours according to the Roman Breviary of 1962. But this raises some questions about obligation. What about Prime? If someone is praying with the breviary of Bl. John XXIII, is he obligated to recite it, seeing as it doesn't exist in the current rite and is thus absent from the current Canon Law? And what about the "little hours," Terce, Sext, and None in the usus antiquior and Mid-Morning, Midday, and Mid-Afternoon Prayer in (the American English translation of) the Breviary of Paul VI? According to the current understanding, clerics outside of choir only have to pray one of these three at some time between Morning and Evening Prayer. Was this a relaxation of the reform or was it in effect before? Is a cleric using the 1962 breviary obligated to all three, or not? Just wondering as I take a morning off to strain out the gnat and swallow the camel. Lee Hamilton left this link in a comment for a recent post, but since it has been amusing me all day, I just wanted to plug it in its own post. Click here to check out Umberto Eco's account of why the Macintosh is Catholic and DOS is Protestant, with Windows being an "Anglican-style schism." It's much funnier than those silly commercials, in which, incidentally, the dorky guy who plays the PC is also a Mac user in real life. Looking through past posts I realize on this feast of the Stigmata of Francis that I have written quite a bit about it; its scriptural basis in Paul's letter to the Galatians, its possible relationship to Francis's supposed medical diagnoses, even its meaning with regard to a fundamental semiotics of the Cross. I suppose this is because the Stigmata of Francis has been a recent discovery for me. In my Franciscan formation not much was made of it; it was either ignored as something belonging to another time and sensibility, or it was dismissed as something gruesome or fantastical. But as I've grown up as a Franciscan, the Stigmata has seemed more and more important to me in my understanding of and devotion to Francis of Assisi. It seems to me that Stigmata are the logical end of saying, as we do in every Eucharist, that we are the mystical Body of Christ. To bear on our own bodies the wounds, or "brand marks" as our Bibles usually translate the Greek stigmata, would seem to be the ordinary result of affirming the God who, in Christ crucified, identifies with our suffering and alienation and pain. Even if there is nothing miraculous to see with the physical eyes, it seems to me that any of our own suffering and pain that we allow to be caught up into the humanity of Christ becomes the sacred Stigmata. To me it's the mystery of seeing Christ crucified in the suffering humanity God has united himself to in the mystery of the Incarnation, of seeing their wounds as the wounds of Christ. Last Friday one of the friars asked me to go computer shopping with him at the SoHo Apple store; he's from a different generation and felt he needed a translator and a bodyguard to face the sea of tech-savvy hipsters that make up both the staff and the customers. The trip was a success and he bought a new MacBook Pro. By divine Providence, the kid who helped us was obviously a good Filipino Catholic boy. At the end of the prayer I was very amused by the cultural dissonance of going right from the Apple Store to Benediction. It was like going straight from the high aesthetic of the post-modern (and "post-Christian") technological world to the high aesthetic of classical Catholicism. The Exaltation of the Holy Cross is a celebration of opposites, of contradiction, and of paradox. Through the Cross the self-emptying humiliation of God becomes the means of our exaltation. My homily for this weekend is posted here. There will always be change; it is an ordinary part of life. Where there is change, though, there is movement. Where there is movement, there will be friction. And where there is friction, there will be heat. Our task in the Lord is to transform the heat into light. I think my traditionalist credentials are pretty good, though there are those who disagree. But if it's one thing I can't get my spirit around, it's so-called "eucharistic miracles." I was talking to someone the other day who was telling me about one. "And then the wine actually turned into the blood of Christ," he said. "Isn't that what happens at every Mass?," I asked. "Yes, Father, but this time it really changed.," he responded. "Doesn't it really change at every Mass?," I repeated. "Yes, Father, but this time you could see it!" That's what gets me. To me, the fact that there is no observable change in the bread and wine has always been constitutive of my very idea of the Eucharist. This is the Lord, who, as St. Francis put it, "hides himself under the little form of bread." This is the God who is revealed in secret and humility. This is the God who, contrary to the pride and desire for signs that live in the human heart, is revealed in the obscurity of of a homeless newborn and in the humiliation of a tortured and executed criminal. That this mysterious God should also hide himself "under the little form of bread" is no surprise. That there is nothing to see with the physical eye is perfectly consonant (and indeed a continuous revelation) with the Nativity and the Passion. It isn't just that the bread and wine become the Body and Blood of Christ, but that Jesus Christ is the sort of Lord who wills to become bread and wine. To me, for there to be nothing to see is part of what reveals the personality of God. God is the opposite of someone who ever makes a big deal about himself, and that's why I don't get this thing with "eucharistic miracles." It's already a miracle precisely because there's nothing to see. That's the "sublime humility" of the living God. "Whatever you bind on earth shall be bound in heaven, and whatever you loose on earth shall be loosed in heaven." Through the humanity of Christ, God has put his own divine forgiveness into our hands. My homily for this weekend is posted here. Big day! 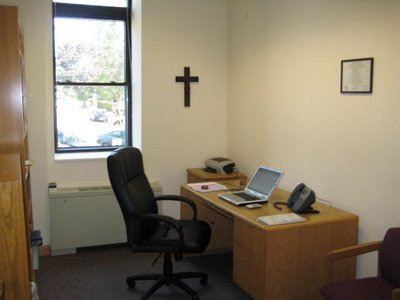 In my 37th year on this earth, with two graduate degrees, in my third real job and third parish ministry, I all of a sudden have an office for the first time. Now people will be able to tell if I am working or not! I discovered St. Gregory only recently. As has happened over and over in my Catholic life, after reading many modern authors, it was not until I read deeper into the tradition that I found something that made sense to me. In this case, in school I was made to read and learn various contemporary theologies and approaches to ministry, but when I finally read Gregory the Great's Book of Pastoral Rule I finally found a treatment of pastoral work that spoke to my real daily experience. There are plenty of priests in both categories!